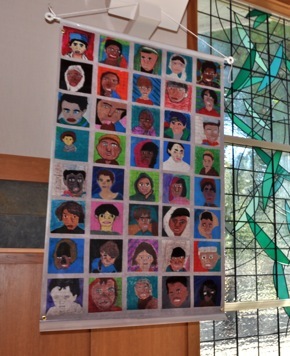 Trinity Church in Menlo Park is the temporary home of six works of art, represententing Windows and Mirrors: Reflections on the War in Afghanistan, a project of the American Friends Service Committee, which is sponsored locally by the Multifaith Voices of Peace and Justice. The 24 touring banners are being displayed in different locations in Palo Alto and Menlo Park, six to eight in each location through next Thursday, Oct. 6. Those at Trinity are hanging in the Chapel, which is open to the public weekdays from 10:00 am to 4:00 pm, Sunday morning, and Monday and Wednesday evenings from 7:00 to 9:00 pm. On Wednesday, Oct. 5 there will be a brief forum “to talk about the banners, our responses to them, and where they might lead us spiritually,” according to the Rev. Matthew Dutton-Gillett, rector of Trinity, to which the entire community is invited. October 7 marks the the 10th anniversary of the Afghanistan War. All 24 banners will be displayed in downtown Palo Alto at City Hall Plaza, with a vigil for peace taking place on Saturday, October 8 from 10:00 am to 2:00 pm. There will be a simple service with prayers and songs for peace at noon.